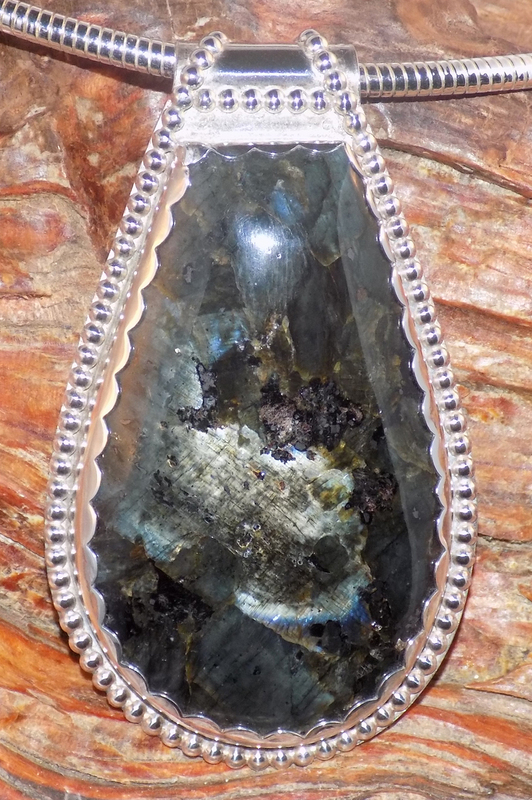 Labradorite is name for the area in the world it was discovered, Labrador. This stone is famous for its reflective qualities and the way light plays on the stone to bring out colors. This Labradorite pendant is offered as pendant only. Its bail has a generous size and will be perfect for a cobra or snake chain form your collection. Note how the Sterling Silver bezel’s design continues into the bail. $195.00 including free shipping within the US. This Labradorite Pendant in Sterling Silver is approximately 2 1/2″ tall, including bail, and 1 1/2″ wide.